Workshops are fun and informative DIY classes for all flower lovers! Your ticket includes all florals to take home, supplies for class, as well as, a small appetizer.BYOB. Hurry and grab your spot, class sizes are kept small for individual instruction. Luther Burbank once said “Flowers always make people better, happier, and more helpful; they are sunshine, food and medicine for the soul.” If you’re feeling a little bit over winter, and want a little extra sunlight and medicine for your soul, playing with flowers is the perfect way. For two hours you will get tips on floral care and design while you enjoy snacks and spirits (BYOB). By the end of the two hours you will have created your own beautiful bouquet that is sure to bring you joy and warmth- even in March. Hurry and grab your spot. Class sizes are kept small for individual instruction. With winter still hanging on, it can be difficult to come up with great birthday experiences in March. We've come up with the perfect solution to stay warm, and brighten up your loved one's birthday! Join us at the floristry to learn how to create beautiful bouquets featuring March's flower- Daffodils. Your ticket includes all of your materials, something to snack on and non-alcoholic beverages such as coffee and tea. You're welcome to really make it a celebration by bringing in your own libations! Class sizes are kept small for individual instruction- so snag your seat today! This Valentine's Day, we want you to spend time with the gals you love the most! 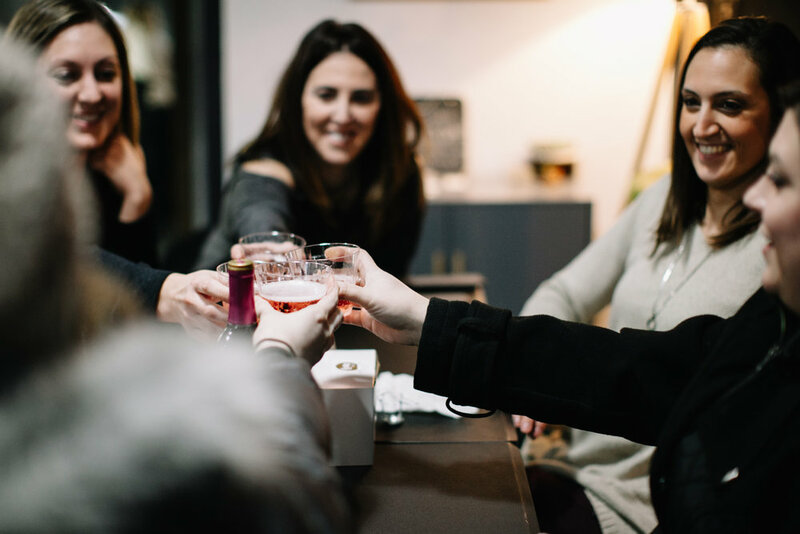 Grab you girls and your wine (or whatever libations you fancy) and join us for a fun and informative two hours of bouquet making. We'll provide you with all the tips and tricks you need, all your materials, snacks and non-alcoholic beverages. We even have a sweet treat in store from our friends over at Sweet Bean Candies. So, what do you say? Will you be our Galentine? Class sizes are kept small for individual instruction, so grab your spot today! It’s the most wonderful time of the year, and you need a macramé hoop wreath! Join us at the floristry for a festive afternoon of wreath making. Over the course of two hours you will be given the tools and techniques to create beautiful, fresh holiday door décor to last the whole season through. You bring your wine, we’ll cover the rest! Class sizes are kept small for individual instruction. It’s the most wonderful time of the year, and you need a wreath! Nothing says "holiday spirit" quite like the look and smell of fresh pine beautifully draped across your mantle, staircase or tabletop! Join us at the floristry to create your own lovely holiday garland. Over the course of two hours you will be given the tools and techniques to create a beautiful, magazine-ready, 6 foot runner for your holiday table, mantle or staircase. Grab your girls and some wine and we'll provide the rest! Class sizes are kept small for individual instruction. Thanksgiving, the official kick-off to the holiday season is a time for family, food, football, and you guessed it- FLOWERS! Impress your holiday guests with a beautiful, fresh centerpiece handmade by you! At this workshop, you will learn the basics of flower care and the elements of design. You will then be able to incorporate those things, along with bold, dramatic blooms and foliage into a breathtaking Autumn arrangement. So, bring a friend (or five) and some wine, and we will help you create the perfect look for your holiday table. Your ticket includes all florals to take home, supplies for class, as well as, a small appetizer. BYOB Hurry and grab your spot. Class sizes are kept small for individual instruction. Mums, Mums, and more Mums! We all love the Scorpios in our life - a little spicy, super loyal, and always fun! There is no better way to celebrate this fiery water sign than with gorgeous, fresh flowers (and some yummy grub). With this workshop you and your November born loved one will work with beautiful Chrysanthemums (November’s flower), and other lush florals to create unforgettable arrangements for an unforgettable birthday gift. Each ticket includes all florals and supplies, as well as, a delicious spread from a local Cleveland joint. We've got you covered with the non -alcoholic beverages, but feel free to bring your own libations! The earthy smell of the outside, the cool evenings & the subtle changes of the colors of leaves can only mean one thing: Autumn is here! Join us at the floristry for a fun and informative evening assembling beautiful fall wreaths. We will use beautiful colors and textures to create a warm welcome for your front door. We use only real flowers and foliage at Lush & Lovely, so we are sure to select things that we know will dry beautifully. In addition, while you're crafting your lovely wreath, please enjoy some eats on us. Feel free to BYOB. Classes are kept small for individual instruction, so don't wait, sign up today! 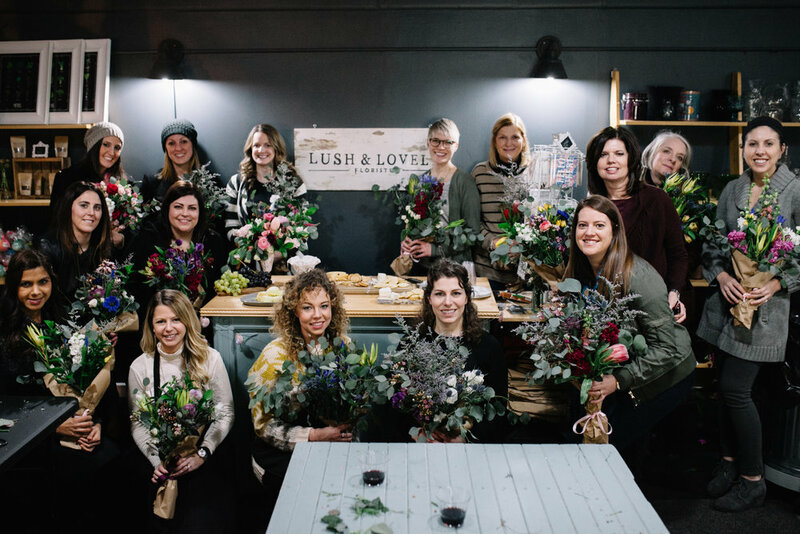 This workshop is everything we love - brunch and bouquets! While you enjoy some delectible almost breakfast, but not quite lunch treats, you will learn to design and care for a hand-tied bouquet. You will then get to choose from beautiful, fresh flowers and foliage to create a Lush Signature Bouquet all your own! Your ticket includes all of your materials, your brunch & non-alcoholic beverages. Feel free to bring the Mimosas & Bloody Marys! Join us for a fun & creative evening making a beautiful, fresh bouquet packed with all the Autumn feels. Come in and learn the basics of floral care and the principles of design while enjoying a delicious appetizer, and whatever beverage you choose to bring! Price includes all materials, a small appetizer, and non-alcoholic beverages. Class sizes are kept small for individual instruction. Hurry and reserve your spot today! Join us for a fun & creative evening making a beautiful, fresh & moody bouquet to really get us in the Halloween spirit. Come in and learn the basics of floral care and the principles of design while enjoying a delicious appetizer, and whatever beverage you choose to bring! Price includes all materials, a small appetizer, and non-alcoholic beverages. Love wreaths, but want something a little more modern? Hoop Wreaths are just the the thing! Over the course of two hours you will learn how to construct a beautiful, autumn wreath on a Macrame or Embroidery hoop and then get your creative juices flowing as you put your new skills to the test. Your ticket includes all materials, appetizers & non-alcoholic beverages. Feel free to BYOB! Do you have a Libra you just love? There is no better way to celebrate their birth month than with a bouquet design workshop here at Lush & Lovely. Over the course of two hours, you will learn the basics of floral care and design as you create your own one-of-a-kind bouquet featuring October's flower: Marigolds. All materials and a small appetizer are included, and you're always welcome to BYOB! Class Sizes are kept small for individual instruction- so grab your spot today! Do you love arranging flowers in vases, but can't seem to get a well balanced look? We can help! Using fresh, beautiful flowers in an array of colors and lush greenery you will be able to create a one-of-a-kind table arrangement that will have your friends asking you for your secrets! Over the course of two hours you will learn the basics of floral care and design giving you the tools to take your creativity to the next level and have it last for you to enjoy longer. Your ticket includes all materials, something to snack on while you work & non-alcoholic beverages such as coffee and tea. Feel free to spice things up a little and BYOB! A fun and informative workshop where you get to create your own succulent terrarium to enjoy for years to come! Your ticket includes: All materials, a block of instruction on basic succulent care and design, snacks while you work & non-alcoholic beverages such as coffee and tea! Want to learn how to make bouquets like the pros? With our build a bouquet workshop you can do just that! Join us for a fun-filled two hours learning the basics of floral care and the elements of design. When you walk out, you will have created a lovely, long-lasting, one-of-a-kind bouquet! Your ticket includes all materials, an appetizer and non-alcoholic beverages! Class sizes are kept small for individual instruction, so snag your seat today! Do you have a Virgo you just love? There is no better way to celebrate their birth month than with a bouquet design workshop here at Lush & Lovely. Over the course of two hours, you will learn the basics of floral care and design as you create your own one-of-a-kind bouquet featuring September's flower- Aster. All materials and a small appetizer are included, and you're always welcome to BYOB! A fun & informative way to beautifully decorate your table! Lush & Lovely + InCuya Music Festival are teaming up to bring you one hell of a workshop! Join us at the Floristry to jam out to our exclusive InCuya playlist and create a one-of-a-kind flower crown that will have you fest ready! Your ticket includes all materials, appetizers, non alcoholic beverages AND the chance to win a pair of tickets to the festival! Feel free to BYOB! Fun & Informative Floral Design Workshop! A Fun & Informative Birthday Experience! Fun and Informative Floral Workshop! As the end of winter is (hopefully) drawing near, we could all use a little bright, happy color in our lives! Join us at the shop to create beautiful, bright bouquets to help usher in springtime! Your ticket includes all materials and supplies, a block of instruction on basic floral care and design, something to snack on while you work and non-alcoholic beverages such as coffee and tea. Feel free to bring your own liquid creativity (libations)! Class size are kept small for individual instruction. Fun & Informative Floral Arranging Workshop! Fun and informative birthday celebration!